Glass Packaging Design & Art Processing by Decotech Inc.
Decotech is committed to providing superior customer service by helping customers in any way we can. At Decotech any aspect of artwork or glass packaging design may be developed, prepared, modified or produced in our state-of-the-art Product Development and Art Processing Departments. Every day our Product Development and Art Processing Departments take the artwork our clients provide and prepare it for use in a high speed manufacturing process on the production floor. We also can assist our clients in the development of original artwork and designs for glass products and packages. With our on-site development and art processing services, our clients will have peace of mind knowing that their glass bottle or container will be decorated properly and to the highest caliber. Silkscreen Printing: Silkscreen printing with our environmentally friendly inks is a great way to print flat, round or oval bottles with your artwork or logo. One color or many colors, silk screen printing is a tried and true decorating technique that we have done some beautiful things with. Pad Printing: Pad printing is a great way to decorate on areas or surfaces that silk screen printing can’t reach. Curved surfaces, sunken areas, crazy angles; we’ve achieved spectacular decorations with pad printing that would have been otherwise unattainable. Digital Printing: Digital printing allows for true CMYK artwork to be placed on your bottle or container for the first time. Photo-realistic or abstract images benefit from the super fine resolution and quality that no other decorating technique besides digital printing can touch. Hot Stamping: This is the most environmentally friendly way to get eye-catching metallic letters and artwork onto your bottle or container. We will match any custom color you bring to us and decorate your bottles in the largest hot stamping department in the industry. Spray Coating: Clear glass is a thing of the past. 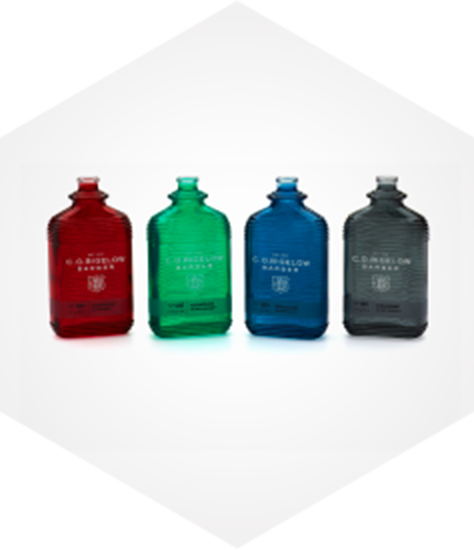 Pick one color, or many colors to bring life to your bottles. Or add another dimension to your customer’s experience by adding spectacular textures to your bottles. Color one panel or create a gorgeous fade. This is how you make a bottle jump off the shelf. Frosting: Give your bottle the sophisticated classic look and feel of a frosted surface in an environmentally superior manner. Combine Decotech’s modern frosting technique with silk screening, hot stamping or other decorating techniques to make your bottle look rich and stand out on the shelf. Spray Masking: Make people scratch their heads wondering how you got your bottle to look like that. Color the front and back panel only. Color the sides all around only. Spray each panel a different color. Knock out your art in the middle of a sprayed panel. The ideas are endless, complex and beautiful. Gluing: Add texture, dimension and beauty to your glass bottle for a special look that can change the whole feeling of your package. Metal, plastic or fabric; we have glued all types of things to memorable packages over the years. Decaling & Chromography: Wrap, bend or fold your artwork over and around curves and angles tough to reach with other decorating techniques. Solid or translucent colors can be used to decorate your bottle in tricky ways. Labeling: We can position your round, flat or oval label with precision every time. Who says you can’t make a label look expensive! At Decotech we aim to be a model of responsible capitalism by providing dignified work, embodying socially and environmentally responsible business practices, committing to continuous improvement and producing things that add beauty to the world. We have the unmatched ability to coordinate the manufacturing and decoration of our clients’ glassware at the most advanced glass decorating facility of its kind. With our unique glass sourcing and management services, Decotech can shorten your total lead time to a matter of weeks, compared to other suppliers who can take months to deliver a decorated, finished product. Learn more about the benefits of partnering with Decotech for your glass packaging decoration needs. At Decotech, we aim to be the “State of the Art in the Art of Decorating” for the global prestige fragrance, cosmetic, tabletop, liquor and giftware markets. Decotech has a long history of industry-leading innovation, and today we have access to the most unique and cutting-edge glass packaging decoration techniques and technologies in the industry. Learn more about the innovative glass decoration techniques we can bring to your project. Decotech is dedicated to excellence, leadership and stewardship in everything we do. As part of this mission, we are committed to protecting the environment around us as well as the health and safety of our employees and members of the communities in which we work and live. Learn more about our commitment to the environment and the recognition we’ve received for reducing our environmental impact. 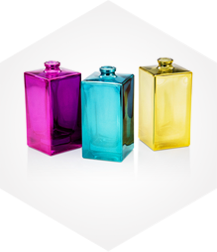 For close to half a century Decotech has provided glass packaging decoration services for the finest fragrance, cosmetic, tabletop and giftware houses in the world. At Decotech we are confident that we can help you make your packaging vision a reality. Get started on your next packaging project by contacting Decotech today. Call us at 201.569.1900 or fill out our online contact form to learn how we can provide solutions for your glass packaging needs.